I know what you're thinking…blueberries and kale? in eggs!? I thought the same thing when I stumbled upon the recipe over at Stupid Easy Paleo. But, having just gone to the supermarket, I had all the necessary ingredients (minus the coconut aminos) and was lacking a good excuse not to try it. That's one of the things I like the most about this Paleo challenge - it's pushing me out of my comfort zone. Never before have I cooked with coconut oil or even successfully made anything with kale! But look at me now. True story: I once went on a date with a... (grammatically, I want to say gentleman, however, he was not)…and was told that he was "looking for a wife, and since I couldn't cook, I was not going to be that person." Yeah, we never saw each other again. For obvious reasons. His loss! Cause look at me now suckerrrr!! That might have gotten a bit out of hand. But seriously!? Back to the point: Breakfast. 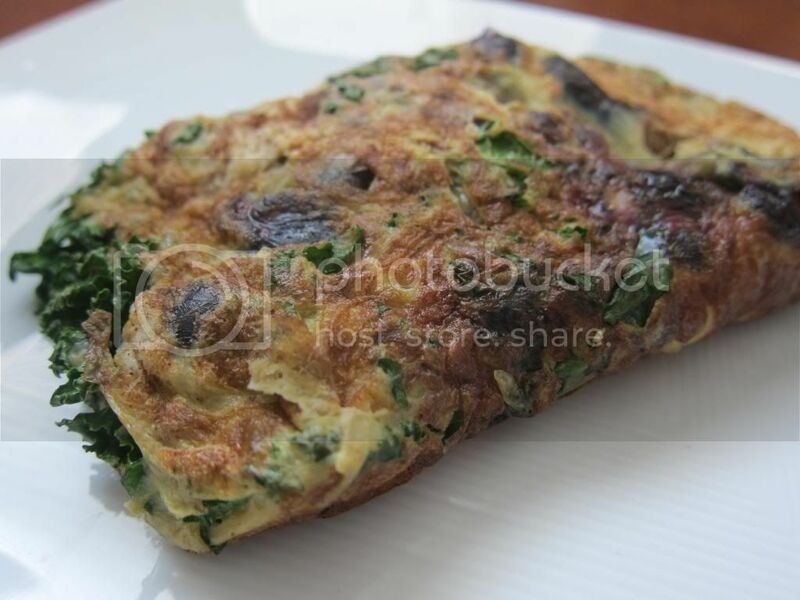 Try this omelette. My attempt looked a bit like a kitchen sink rendition and less like the traditional half-moon omelette. But it was tasty. I chopped my kale up in small, teeny tiny little pieces seeing as I'm a texture person. You people who like rice pudding are seriously messed up in the head. But I must say that I liked this new twist on eggs! The eggs were savory, the kale was earthy and the coconut oil and blueberries were sweet! As previously mentioned, I followed the recipe sans the coconut aminos…so I'm not sure how that changes things, but nevertheless, it was a filling and innovative way to start my morning! Veggies for breakfast! Since having tried this fruit + veggie combo with eggs, I think they'd make a great addition to any coconut milk smoothie - stay tuned for that! 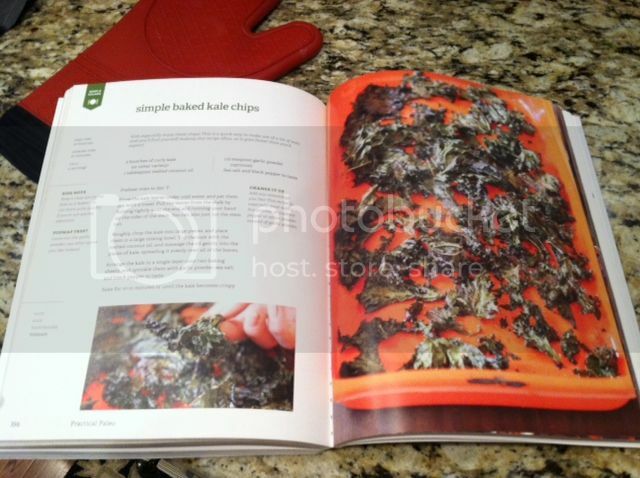 Just recently I was asked by a girlfriend to share some new kale recipes. She wanted to add kale to her diet and didn't really know how. I told her that I didn't have much experience with the green leafy vegetable but that I'd work on experimenting with a few recipes. The basics: Kale Chips. Admittedly, I had tried making these before and I think I may have left them in the oven for too long because when I asked my family to taste them I only received grimaces and negative reviews. They tasted a lot like burnt brussel sprouts with a weird, crunchy texture. But, since I'm resilient, I gathered my ingredients and tried again dammit! 1. Set your oven to 350 degrees F. 2. Line a baking sheet with tin foil. 3. Remove leaves from kale stalks, breaking them up into small, bite sized pieces. 4. 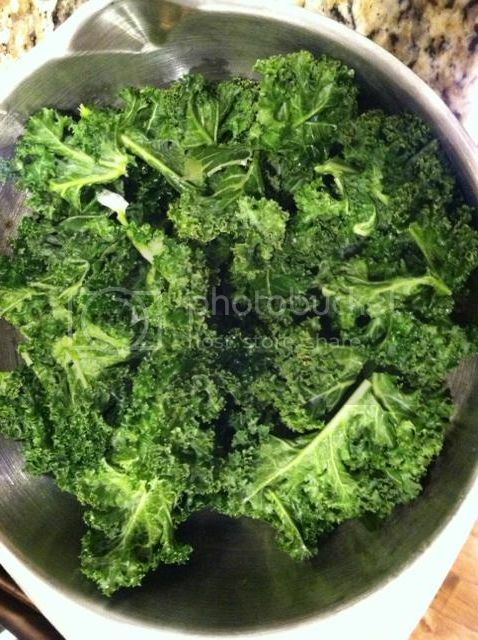 Toss kale into a medium sized bowl. 5. Melt coconut oil and drizzle over kale leaves. 6. Massage oil evenly into the leaves. 7. Once covered, add garlic powder, salt and pepper, to taste. You could also use some cayenne pepper if you favor a little spice! 8. Evenly spread leaves onto lined baking sheet. 9. Bake for 10-15 minutes or until edges are crispy and golden brown. WARNING: these burn very quickly turning to brown dust in the blink of an eye, so keep an eye on the oven! In review: Success! I enjoyed these chips as a compliment to my lunch. I liked these much better than my last batch. I was vigilant in my timing and the result was an earthy, slightly tangy green chip substitute. Would I make them again? Yes. Would I serve them at a dinner party? No. A health food dinner party? Yes…actually, that's a brilliant idea! Let's throw one of those! Whew! That's a mouthful. And boy was it ever!! I was really excited to have a few unexpected hours to myself the other day so I decided to get a head start on my kitchen workout - preparing/cooking/portioning my food for the week - so that I can enjoy healthy meals on-the-go instead of ordering in or hitting a drive thru due to a tight schedule and/or lack of cook time. I knew I wanted to make the flank steak I had purchased the day before, but I wasn't quite sure how I was going to make it. I opened the fridge and grabbed a few veggies that needed to be eaten and asked myself, what can I make with these ingredients that tastes amazing? Easy answer, STIRFRY! Stirfry can be anything you want it to be and it takes you only a few minutes to make a big batch. ** mushrooms, carrots, broccoli, etc. can all be added according to your preferences and fridge contents! 1. Heat coconut oil over medium heat in a large frypan. 2. Season beef with garlic, salt and pepper. 3. Sautee in oil until browned on all sides. 4. Remove from heat and transfer to a plate, set aside. 5. In a small bowl, combine lemon juice, ginger, pepper and chicken broth. 6. 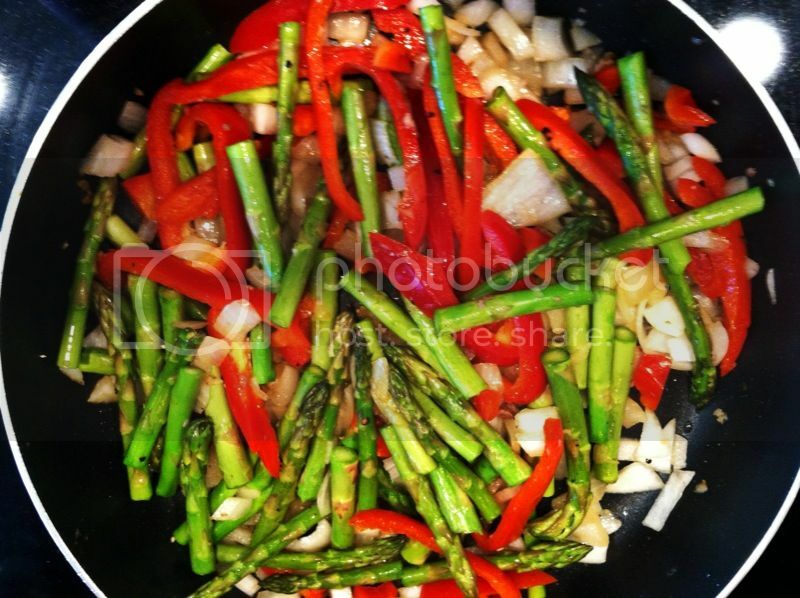 In the reheated pan, cook asparagus, peppers and onions until they begin to soften. 7. Add chicken broth mixture, cover, stirring occasionally until the broth has reduced and the vegetables are tender. 8. Return beef to the pan and add diced green onions. 9. Mix until coated. 10. Allow to simmer for a few minutes and then wa-la! This recipe can serve up to 4 people, or can be stored and eaten throughout the week. If you're not eating strictly paleo, you can enjoy the stir fry over 1/4 c. of brown rice or quinoa to add a healthy, whole grain carbohydrate! In review: It was delicious. Did I mention I love cooking with coconut oil? It makes everything taste better. I also added a few sesame seeds (mostly because I think they look nice), even though there is no soy sauce or distinct Asian flavors in the dish. Play with it! I was more than satisfied with this high protein, high fiber filling meal. Plus, I felt pretty awesome about having included vegetables in my breakfast, lunch AND dinner.